Fact: Bernie Sanders’ tax plan has been released, and it is a top marginal tax rate of 52% (meaning income above $10,000,000 would be taxed at that rate). The 90% figure comes from his alluding to the fact that the top marginal tax rate has been as high as 92% (including under Republican President, Dwight Eisenhower) with no apparent loss in economic growth. 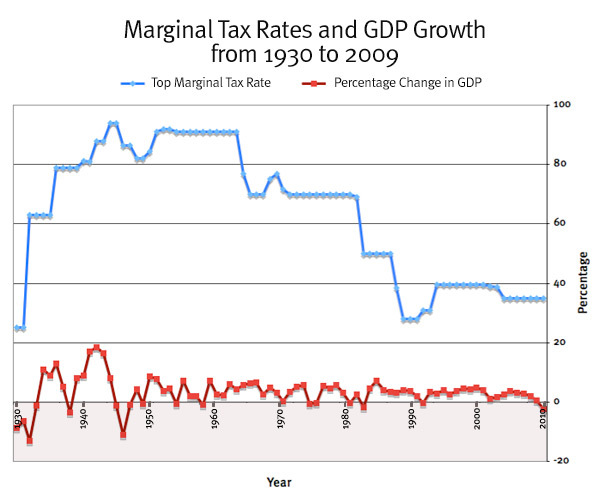 The chart below shows the history of the top marginal tax rate in the US. From the great depression until John F Kennedy, it remained near 90%. Under JFK, the rate would be lowered to around 70% where it would remain until t would be reduced further under President Reagan. Today’s 39% is actually quite low in relation to the post world war 2 years. 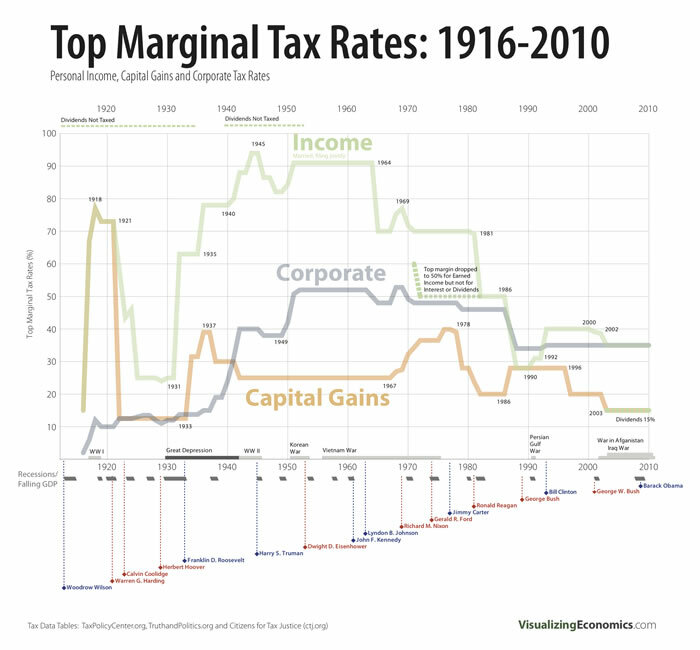 Explanation of top marginal tax rate. Part of the confusion stems around a misunderstanding of how a top marginal tax rate is applied. This rate is applied to the highest tax bracket and any income above that threshold. For example, if the top marginal tax rate is 50% on incomes above $250,000, a person making $300,000 will have a 50% tax rate on that last $50,000 (the difference between the $250,000 threshold and the $300,000 they earned), not on the entire $300,000. The misunderstanding of marginal tax rates has led some to assume that a 90% top marginal tax rate (if applied) would literally be applied to their entire income. To add to the confusion, some are even under the impression that it would be a 90% tax rate across the board (regardless of income). This is not how a top tax rate works. The origins of the claim are based on an interview with CNBC’s John Harwood. Sanders: Radical socialist Dwight D Eisenhower was president. I think the highest marginal tax reach was something like 90. Harwood: When you think about 90%. You don’t think that’s obviously too high? Sanders: No. What I think is obscene and what frightens me is again, is when you have the top 1/10th of 1% owning almost as much wealth as the bottom 90%. This statement led some claim that Sanders intended to raise the top marginal tax rate to 90%, which he has denied. The argument here is that a 90% top marginal tax rate has existed in the past (and with faster GDP and job growth than we see under today’s far lower top tax rates). Nevertheless, there is no indication that there was ever a plan to actually reintroduce this tax rate, and Sanders’ actual tax proposal has a top tax rate of 52% (placing closer to where it was during President Reagan’s time in office. The relationship between tax rates and job growth has long been a source of debate between Democrats and Republicans. It is often assumed that lower taxes free up capital for job creation, and this argument certainly has an advantage of feeling intuitive, despite its apparent lack of empirical evidence. 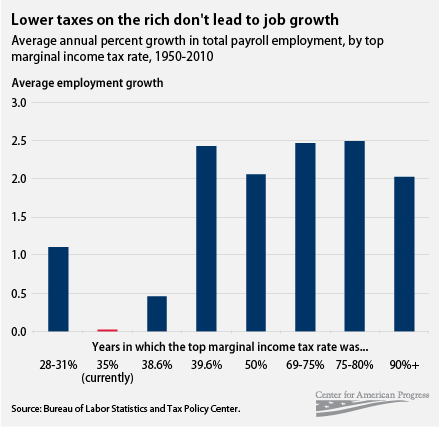 This graphic below attempts to explain how high tax rates may actually spur job growth (by pushing companies to hire employees instead of paying so much in taxes). Fearing that knowledge that today’s top marginal tax rates are actually quite low might open up people to the idea of raising the top marginal income taxes, anti-tax activists often respond by muddling the total tax rate as a percentage of GDP collected in order to argue that higher tax rates on the top don’t lead to greater overall collection, or that the top earners are paying an even higher percentage of the income taxes. 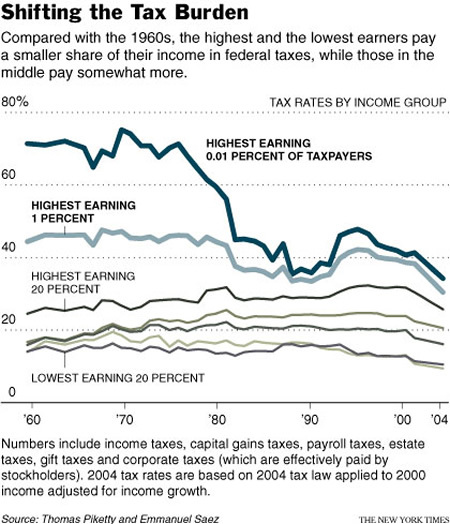 What they leave out, of course, is that lowering the top marginal tax rates have led middle and lower earners to shoulder a higher percentage of the overall tax burden, which has been shifted onto payroll taxes (of which lower and middle-income earners pay a higher percentage than higher earners). The “Gun Show” Loophole: Myth or Fact? Is it Real? What about the Positive Impacts of Global Warming? Did Climate Change Cause Hurricane Irma, Harvey, Sandy or Katrina? Tim Allen’s Last Man Standing Cancelled for Political Reasons? Did Jerry Brown call California Tax Payers Free Loaders? Not likely. Did NYC Ban Hot Dogs?